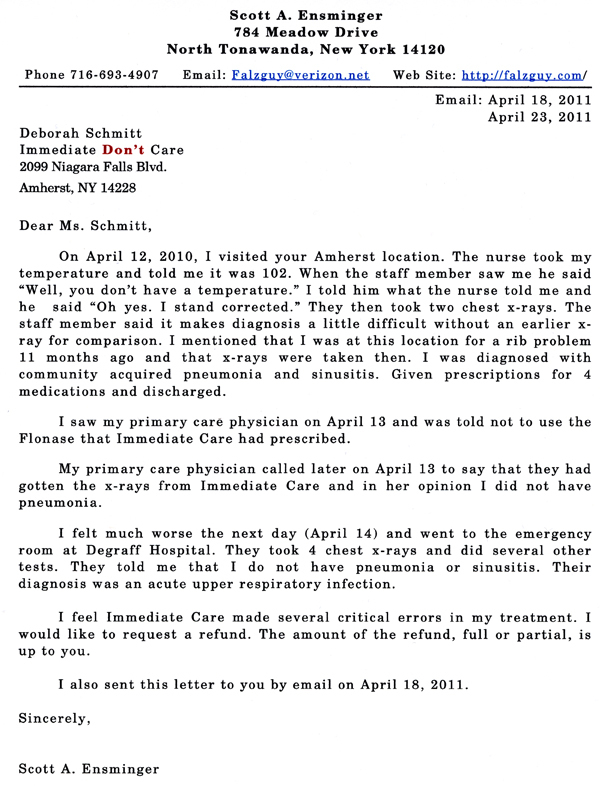 Below is a letter I sent to Immediate Care. I made a correction to one of the dates in the letter. I listened to a phone call from the Medical Director for this Immediate Care on April 28. I say listened because the person hardly let me get a word in. He apologized for the mistakes that were made. This meant little to me as it should of been the person who made the mistakes that apologized. The Medical Director who apologized to me was not in the examination room and has never examined me. The Medical Director just kept stressing that Immediate Care made a good diagnosis, and seemed to brush aside any comments I was able to squeeze into the 10 to 15 minute one sided phone call. I became very frustrated (I still was not feeling that well and my Dad was in the hospital at the time), told the caller I would be picketing the Immediate Care establishment, said goodbye, and hung up. The Medical Director never mentioned my request for a refund. While Immediate Care did help me somewhat with my illness, I still feel I am entitled to a partial refund the very least. My emails to Immediate Care have not been answered. I don't think I'll be using Immediate Don't Care anymore. Copyright © 2011 by Scott A. Ensminger.